The Queen was replaced by the Prince of Wales in part of her planned duties at the Order of the Bath service. The 88-year-old monarch had been due to make an offering as 12 new knights were installed at Westminster Abbey. But Buckingham Palace said the role, involving climbing steep wooden steps in full regalia, was instead filled by the prince, to "lessen the burden on the Queen". The Order of the Bath is an order of chivalry dating back to 1725. The Queen is Sovereign Head of the military order while Prince Charles is its Great Master. It is awarded in the ranks of Knight Grand Cross, Knight Commander and Companion, and services are held every four years. 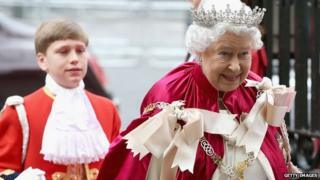 The Queen attends every eight years, and was greeted by the Dean of Westminster at Friday's event. She had been due to be photographed making the presentation of gold and silver coins, a symbolic surrendering of worldly treasures, echoing a painting of her grandfather, George V.
A Buckingham Palace spokesman said the decision for Prince Charles to step in had been taken the night before the service. He stressed that the sovereign's stall within the Tudor chapel was reached by very steep wooden steps and that the Queen would be wearing her full regalia. He added: "The decision was taken to lessen the burden of the Queen during the ceremonial service - it's for the Queen's comfort coming into and out of the stalls." Earlier this year, it was announced that the press offices of the Queen and the Prince of Wales would be merged, in a sign of preparations for when Prince Charles becomes king. The prince replaced his mother at a Commonwealth heads of government meeting in Sri Lanka in November, as Buckingham Palace reviewed the amount of long-haul travel the Queen undertook. At the Order of the Bath service, a number of senior military figures were installed as Knights Grand Cross, replacing previous holders who had died. They included former First Sea Lord Admiral Sir Jock Slater and Field Marshal, and former Chief of the Defence Staff Lord Guthrie of Craigiebank. The Order of the Bath originated in the medieval period when the honour was only conferred on a knight after he had performed a number of rituals designed to purify the inner soul - fasting, vigils and prayer. It takes its name from the symbolic bathing which in former times was often part of the preparation of a candidate for knighthood. Services take place in the abbey's King Henry VII's Lady Chapel, where the banners of living knights hang above the stalls.